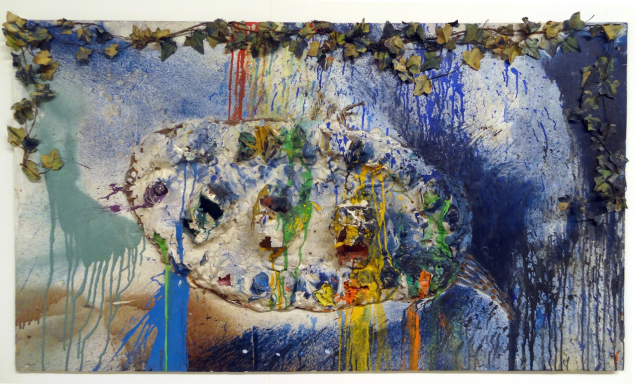 Benjamin Sutton recently visited Art Basel Miami and discovered Niki de Saint Phalle’s Tirs (Shooting Paintings) at the booth of prominent French Galerie Georges-Philippe and Nathalie Vallois. The gallery brought their exhibition ‘Niki de Saint Phalle: En Joue! Assemblages and Tirs (1960–1964)’ to Miami after its debut one year ago in Paris. Accompanying it is a comprehensive and extraordinary catalogue available at the gallery. In his blog “HYPERALLERGENIC”, Sutton reviews the exhibited works with beautiful detail images. He writes: “The exhibition’s most colorful piece, “Tir (Fragment de Dracula II)” (1961), for instance, looks like a riotous drip painting from afar. But on closer inspection one can clearly see where the artist and her cohorts (including the influential critic Pierre Restany) shot through balloons full of paint with a rifle. The work’s surface is pockmarked with eruptions of color like miniature volcanoes. Unlike the smoothed lines and saturated hues of her best known works, this piece and others on view here bear witness to an unexpected belief in the creative potential of destruction.” Learn More. Niki de Saint Phalle. “Tir (Fragment Dracula II), 1961 © 2014 NIKI CHARITABLE ART FOUNDATION, All rights resrved. Photo credit: Benjamin Sutton/HYPERALLERGENIC.